As has been the case in prior Congresses, the 115th Congress is more Christian than the U.S. population as a whole. The vast majority of the nation’s federal lawmakers (91%) describe themselves as Christians, compared with 71% of U.S. adults who say the same, according to a recent Pew Research Center analysis of congressional data compiled by CQ Roll Call. Here are some other facts about the religious makeup of the current Congress, focusing on state congressional delegations. 1More than half the states (28) have delegations that are composed entirely of Christians. These delegations range in size from three members (as with Alaska, Delaware, North Dakota, South Dakota, Wyoming and Montana) to 38 (Texas). In none of these states is the general population more than 86% Christian. (Alabama is 86% Christian.) In several of the states on this list, such as Massachusetts, the share of Christians in the general population is roughly six-in-ten. 2While nearly half of all American adults are Protestant (48%), six states have delegations that are 100% Protestant. These states are Alabama (nine members of Congress), Delaware (three), Kansas (six), Montana (three), Oklahoma (seven) and Wyoming (three). Four other states have delegations without any Protestants: Hawaii (four members), Idaho (four), Utah (six) and Vermont (three). 3Catholics, who make up 31% of Congress and 21% of the adult population, are included among the congressional delegations of all but 11 states. And nine states have delegations in which half or more are Catholic, including the large states of New York, with 17 Catholics among its 29 lawmakers, and Pennsylvania, with 13 Catholics in its 20-member delegation. In addition, five of the states with delegations that are half or more Catholic – Alaska, Maine, North Dakota, Rhode Island and Vermont – send only three or four lawmakers to Congress. 4There are 17 states with at least one Jewish lawmaker, and six of these states have more than one. California and New York each have five Jewish legislators, Florida has three, and Illinois, Maryland and Tennessee each have two. The states with one Jewish member of their congressional delegations are Colorado, Connecticut, Hawaii, Kentucky, Michigan, Minnesota, Nevada, New Jersey, Oregon, Rhode Island and Vermont. The 30 Jews in the 115th Congress make up 6% of the body; Jews make up 2% of American adults. 6Only one state has no Christians in its congressional delegation. While 63% of adults in Hawaii are Christian, Hawaii’s delegation is made up of two Buddhists, one Hindu and one Jew. 7There are 20 states that have at least one non-Christian member of Congress. Of these states, just eight have more than one non-Christian member in their congressional delegation: California (seven), New York (five), Hawaii (four), Florida (three), Illinois (three), Maryland (two), Minnesota (two) and Tennessee (two). Overall, Congress has 30 Jewish members, three Hindus, three Buddhists, one Unitarian Universalist and one religiously unaffiliated member. There are also 10 members of Congress who declined to specify a religious affiliation and they are not counted as Christians or non-Christians. 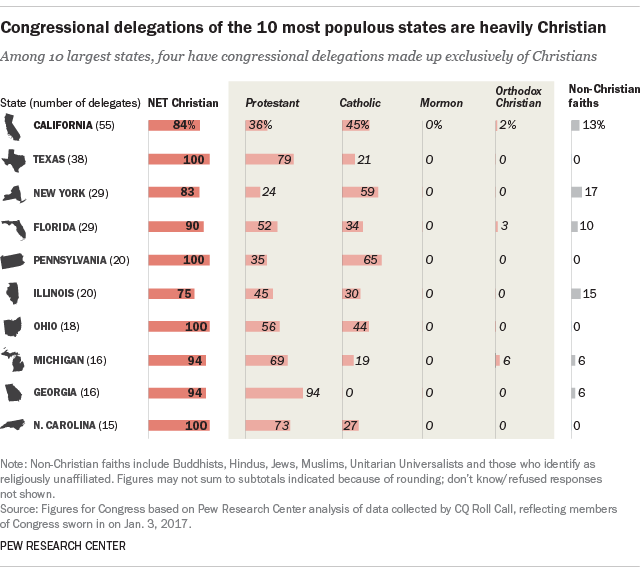 Note: The religious makeup of all states’ congressional delegations can be found here (PDF).